Misa Bharti has drawn flak for saying at a party workers' meeting that she felt like chopping off Union minister Ram Kripal Yadav's hands for supporting BJP's campaign against Lalu Prasad. 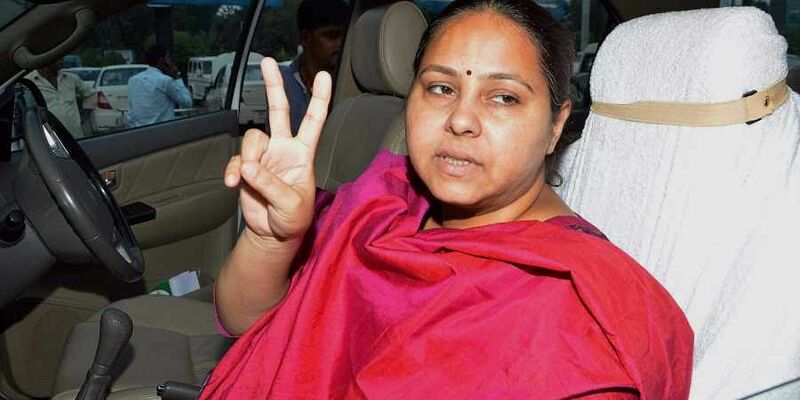 PATNA: Jailed RJD chief Lalu Prasad Yadav's eldest daughter and Rajya Sabha member Misa Bharti has drawn flak for saying at a party workers' meeting that she felt like chopping off Union minister and BJP leader Ram Kripal Yadav's hands for supporting BJP's campaign against her father. "He (Ram Kripal) betrayed the man (Lalu) who had taught him politics by holding his hands. He used to cut hay for a living. I had high respect for him, but he fell from my esteem. The day I saw him holding a book written by Sushil Modi, I felt like chopping his hands off with the same hay cutter," Bharti is heard telling a large gathering party workers at Bikram in Patna district on Wednesday. Bharti was apparently referring to a book written by Bihar deputy chief minister Sushil Kumar Modi of BJP documenting the "benami" land deals allegedly involving the RJD chief and his family members. The book, Lalu Leela, was released in October last. Ram Kripal Yadav, who is the Union minister of state for rural development, had been a loyal aide of the RJD chief for close to three decades till March 2014. When Bharti wanted to make her debut in politics, the RJD chief decided to field her from Patliputra Lok Sabha constituency even though Ram Kripal, then a three-term Lok Sabha member from the party, was all set to be the RJD candidate from there. He switched sides to BJP and contested against Bharti, beating her by 40,322 votes. "My words are being willfully misconstrued by my political rivals. I did not mean those words literally," said Bharti, who was nominated to the Upper House of parliament in June 2016. She is preparing to contest the upcoming Lok Sabha polls from Patliputra constituency, most possibly against Ram Kripal Yadav.RJD leader and Rajya Sabha member Manoj Jha said Bharti's statement was a "metaphorical way of speaking" and that there was no hint of violence in her words. "She meant to say that Ram Kripal was among the strongest hands of RJD as one of the closest aides of Lalujee. Her words should not be taken literally," he added. But Bihar's ruling JD(U) and BJP slammed Bharti and demanded the strongest legal action against her. "Despite being a woman, a trained medical doctor and an MP, she used such violent thoughts, betraying her poor upbringing. She must apologise immediately," said JD(U) MLC and spokesperson Neeraj Kumar. "BJP demands Bharti's disqualification from Rajya Sabha and strong legal action against her for using such violent language against a serving Union minister," said BJP leader Prem Ranjan Patel. Ram Kripal Yadav, who is currently on a tour of Lakshadweep, was not immediately available for comment.